One of the less air-brushed areas of Oia. There are still places to explore on this magical, if sometimes overwhelming, island. In 2002, I visited Santorini for the first time with a friend of mine, Oliver. Words are inadequate to describe the impression the island left on us, so let our actions speak for themselves: we decided on the spot to return here, build a home and open a little shop that would sell nice things to read. We believed that we had found the best spot in the universe to sit quietly in good company, drink a glass of wine and enjoy a good book. 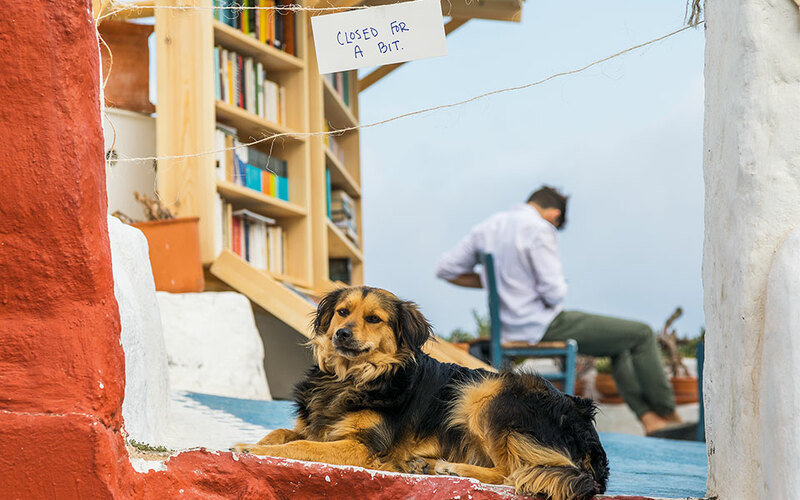 Fifteen-plus years later, on the cliffs of the north-side town of Oia, sits our Atlantis Books, the love-child of an ever-growing group of friends who have transformed a little bookshop into a humble institution, filling its rooms with great literature and making it a space to greet new visitors from across the world. Even during our first years, around 2004, only traces of “old Santorini” remained; those remnants often hid in shame amid a sea of plastic pastel paint and burgeoning strips of artisanal boutiques. The villagers watched as convoys of fully loaded donkeys carried cement and bottled water through the streets, and declared: “Well, after this year, they cannot possibly build any more.” And then they would say the same the next year, watching those same donkeys. One of the four-legged members of the Atlantis Books team. Now, as we reach our 14th year in the village, we are still sighing. But isn’t it sublime to watch the evolution? Over the years we ingest, bite by bite, block by block, the slowly sprouting collage of new carvings, buildings and luxuries that appear in countable numbers each year, as Santorini grows into its relatively sudden pubescent emergence as a mecca of early 21st-century tourism. 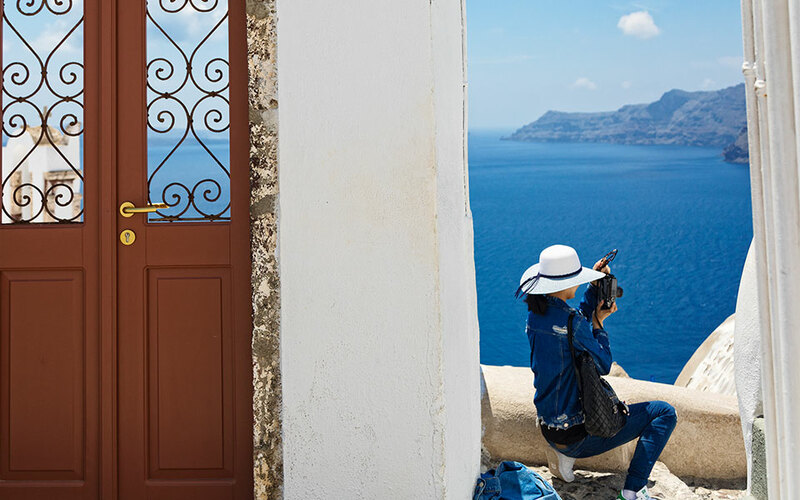 Now, in the spring of our 15th year, in our unofficial role as our town’s resident expats of note, we are approached between 15 and five million times a day by strangers who ask us for advice on how to spend some of their precious vacation time on Santorini. We don’t take the responsibility lightly; at this point I’d say we’re professionally capable of answering the question. 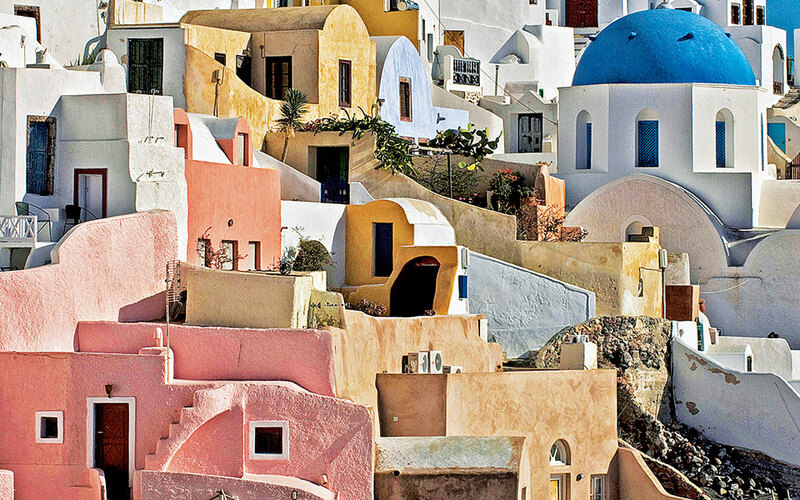 A: Santorini is a brutal tourist destination. The social and cultural life is nearly all artificial, given that the island has only awakened from its sleep in the past 30 years or so, and that most buildings here are younger than the cars that clog its rocky, winding roads. Santorini is an island riddled with tourist traps, a place where it is exceptionally difficult to reach a spot that has not been pre-pampered and airbrushed by tourism. B: We of the island are very protective of the few secrets we have left. Here’s the paradox, as the Greeks would say: I know a few places that you don’t know. But the moment I tell you about them, they cease to be my hidden gems. How do I share the wealth if, in doing so, I immediately devalue the currency? C: It’s simply a beautiful island, and that’s enough. It’s very easy to understand a traveler’s instinct to soak up every sensation available from a once-in-a-lifetime, out-of-the-way destination like Santorini, but the longer we are here, the more convinced we are that the immediate point and most transcendent element of Santorini is to be found in a simple, wistful gaze at the elegant cave-houses, snow-flecked on the cusp of an impossible caldera. We know that no matter what particular advice we give, there is no tip that will deliver anything near the joy that can be derived from a simple, holy moment enjoying the view. The lighthouse near Akrotiri is a great sunset spot. So, the bookshop’s strategy has consistently been to help nice people avoid the pitfalls and perils of the worst of Santorini as much as possible, to hint to people how they might go about “accidentally” stumbling upon our secret spots, and to remind people to relax – they’ve made it to the island, they’ve done the heavy lifting, don’t worry, find a perch, enjoy the view – perhaps with a good book in hand. But. In the past 18 months, something smells a bit different on Santorini. Perhaps it is our overflowing landfill, or first branch of McDonald’s. More hopefully, it is a new wave of refined taste and respect emanating from the most recent generation of entrepreneurs and adventurers who still see potential for this island where others see nothing but capacity. In that hopeful vein, one might say that so much touristic, overpopulated sh*t has piled onto Santorini that shoots of a new era are starting to spring. And there might just be enough of a real society taking hold here that we can allay the casual visitor’s fear of missing out and still maintain the community and integrity of our intrepid residents. More cynically, we are losing so much goodwill and so many good tourists, and we are so overwhelmed by crowds and semi-comatose commercialism, that we’re kind of in an emergency mode right now. So we might as well unleash the floodgates of our secrets and do everything we can to convince people that we’re more than just cruise boats and sunsets, that we really do have something good going here, and that Santorini is so much more than just a postcard. Therefore, in the spirit of a sh*t-born spring, I give you, in a few words, some of what I know. I hope – no, I beg – you to use it respectfully. Don’t kill our home! Come see it, swim it, taste it. Come make it more beautiful, come make it kind. Come visit me in person and I’ll tell you more. For the best views of Santorini, take the boat to Therasia. Here, the Church of Aghia Eirini, dating from 1867. — The best view of Santorini is not found on Santorini itself, but on Therasia, the chunk of island severed from Santorini some millennia ago in an explosion. Take the ferry there for one euro, strap your boots on, bring an apple for the donkey, pick some fresh lemons and breathe in relief when you find the real Santorini you never knew you wanted all along. 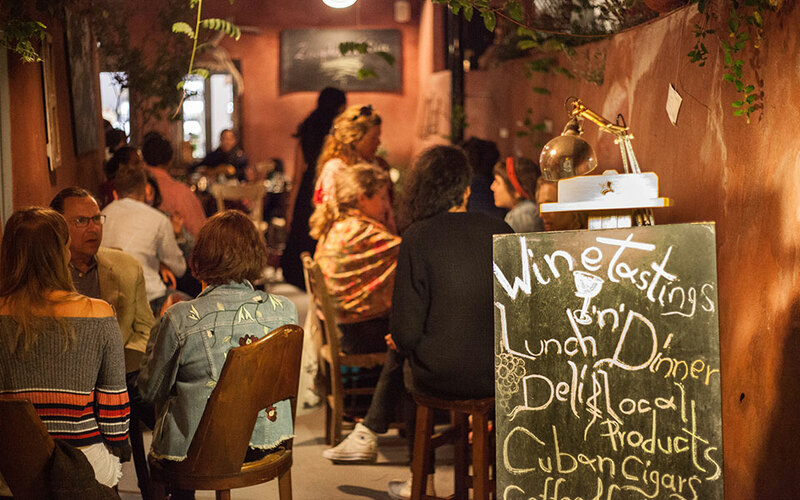 — Grab an aperitif or a nightcap at Vineyart in Oia. Welcome to what we hope is the future of our island. Opened recently by a smashing group of the best young dynamic lads in town, it’s spacious, quiet and serves an impeccably curated menu of local foods and the full, meticulously researched gamut of every wine grown on the island. This is the newest haven for the Atlantis Books team – finally, a private space that feels calm and quiet and public, where you can run into friends and just know that good conversation awaits at welcoming tables with classy eclectic music riffing over the summer breeze. Find us here reading in the afternoons and reveling at night. We’ll pull up a chair for you. Everywhere on Santorini, even in the archaeological site of Akrotiri, you’ll be tempted to take pictures, but it’s better to look first and snap later. — Enjoy a three-hour meal at Metaxi Mas in Exo Gonia. Make reservations because you are officially the last person to hear that this is the single most satisfying eating experience on the island. — Stroll around the Akrotiri archaeological site. 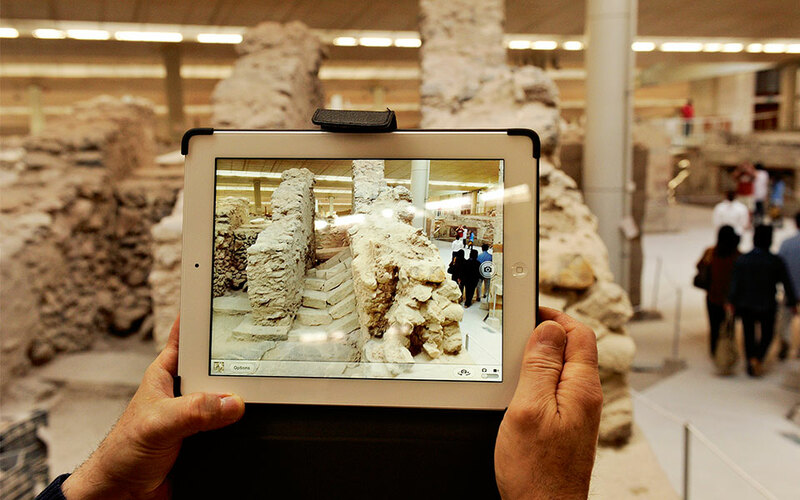 Don’t get too bogged down in details; just know that you’re walking in one of the oldest places you’ve ever been. Enjoy the air and the sunroof. Ask to see the world’s oldest toilet. 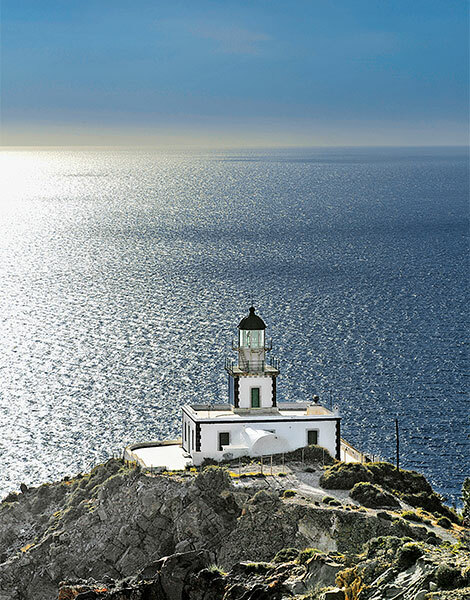 — Visit the lighthouse on the island’s southern tip at sunset. Bring a bottle of wine and a blanket and prepare to think big thoughts. — Gaea is a truly fine, old (and thankfully unimproved) winery with a bamboo-roofed gazebo that is so close to the beach that you can order a white wine, jump in the water and be back at your table by the time the bottle is uncorked. The twin brothers running Altana, in Imerovigli. 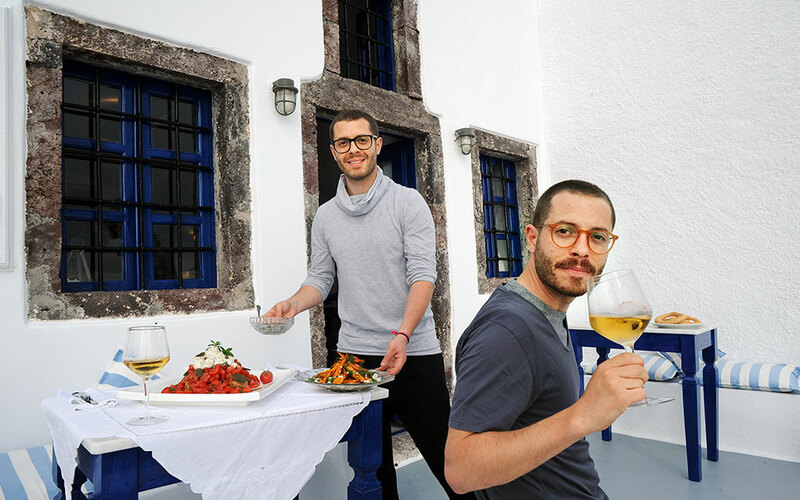 — Stay at Altana in Imerovigli and find yourself amused and confused at how, in a world of so much evil and frustration, a set of twin gentlemen could possibly be so truly, deeply nice, helpful and fun while running such an eminently professional, intimate and gorgeous little hotel. And get them to mix you a cocktail in their very own kafeneio. — Take a full day to just drive off the beaten paths. You can’t get lost. It’s an island with a huge volcano in the middle. Find a quiet spot – there is no wrong spot – and make it your own. — Stop at any beach off a rocky or winding road. If you want sand and surf, go to California. If you want truth, go to Katharos, Caldera, Vlychada or Exo Gialos, or any patch of sandy rock, and swim like a true volcanic islander. 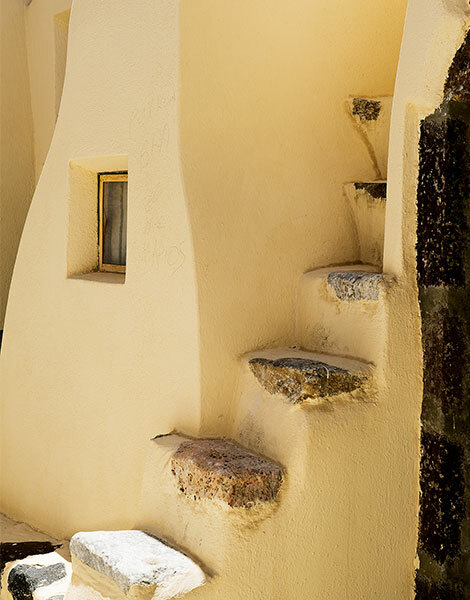 Villages such as Emporio offer an element of shelter and authenticity that Fira could never give you. 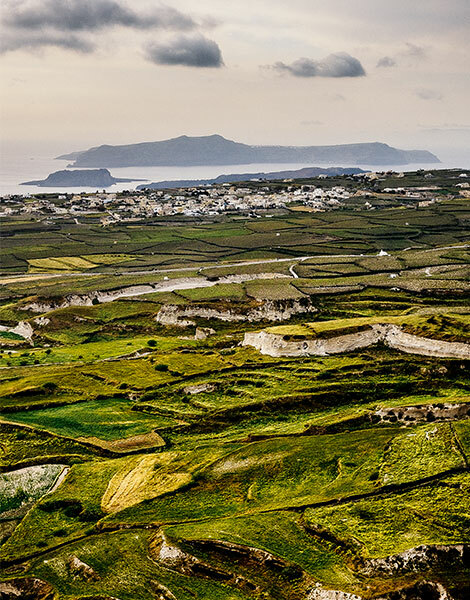 The view over the caldera is not the only stunning vista you’ll come across on the island. — Avoid Fira, the capital and the heart of darkness. 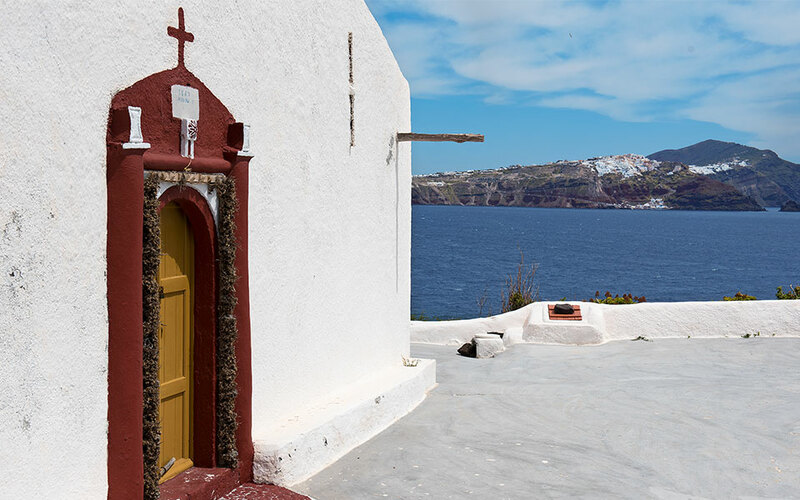 Gravitate to Pyrgos, Emporio, and Megalochori – they’re off the cliffside but offer vistas of their own and an element of shelter and authenticity that Fira could never give you. — Don’t go to Santorini in August. It’s too crowded. Hopefully, that will change in a few years but don’t be a hero. Wait until the off-season. My favorite months are April, May, September, October and (for the not-faint-of-heart) January. — If it’s too late and you’re already booked for August, wake up early and get off the beaten paths. Take siestas and emerge again when the sun has gone down to explore the main streets. Make a plan. Rent a car and make dinner reservations ahead of time. Then come again when it’s not August to see a side of the island you just can’t get when tourist season is in full swing. In photography, as in anything in life, discretion is important. Don’t forget to be polite! — Any produce being sold at a market stall or near a church is worth buying. — Take naps. They’ll naturally mold your day, giving you peaceful times early in the morning and late at night, perfectly aligning you with the contours of the island. — Use your camera wisely. Photograph to your heart’s content but enjoy with your own eyes first. If you’d like to take the picture of a person or the inside of a person’s home or business, ask for permission first. In sum: be reasonable and respectful. Trust me, photography etiquette goes a long way in a tourist community. — Life can get stressful even on vacation, but keep in mind that generally all workers on Santorini work seven days a week during the tourist season. So, if you’re thinking of being short-tempered with a sales clerk, or a waiter, or a taxi driver or a concierge, or if we seem short-tempered to you, just take a deep breath and encourage us to do the same. — Watch out for donkey poop. 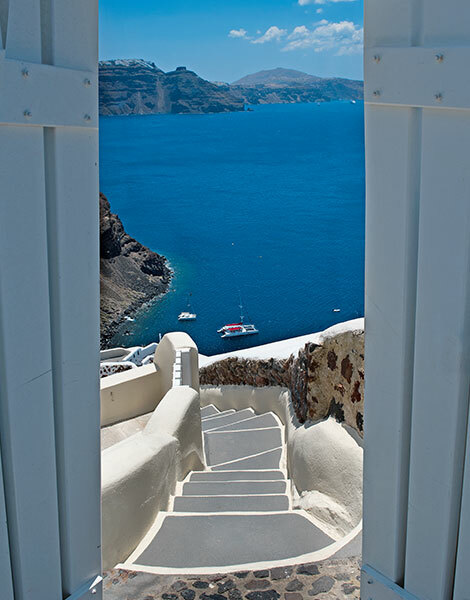 — It bears repeating: there is no way to miss out on the “true” Santorini experience. Make sure you take the time to take your time. 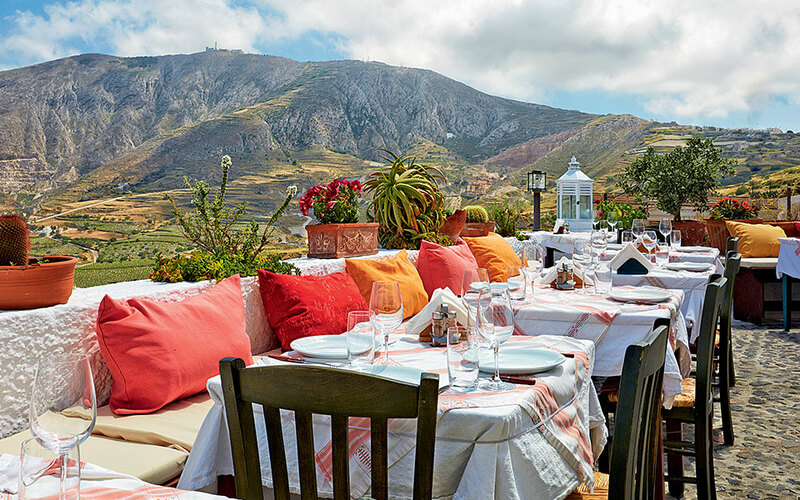 Find a favorite spot – a restaurant, a beach, even your room’s little terrace – and spend some time eating feta and tomatoes soaked in olive oil with a cold glass of wine to wash it down. This moment of sitting peacefully with an extraordinary view to soak in – this is the essence of the Santorini experience. — Finally, allow me to brazenly suggest you get yourself a good book as well, for the quiet moments in-between. 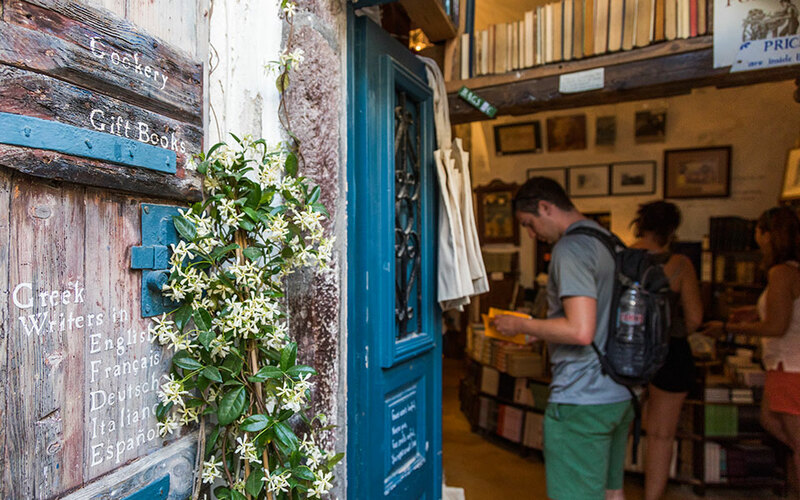 Perhaps you can find that book in Oia, at Atlantis Books – one of the best bookstores on Santorini. Come join us. Santorini is still a miracle and worth fighting for. See you soon.